San Antonio is major touristic place of the island. 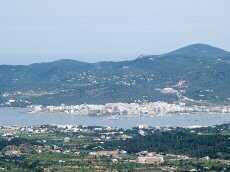 The is the city situated near all the famous beaches (Cala Bassa, Cala Tarida...) and San Antonio hosts two night clubs (Es paradis and Eden). 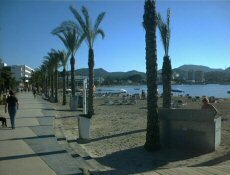 This is the walk situated around the San Antoni bay (Badia de Portamny). This is pleasent to walk there the night. At one end of the walk is situated Sa Punta de Moli (place where an old mill is maintained) and at the other, this is San Antonio center with a splendid fountain which rate its movements with the the music diffused on the public place. The sunset is one of the famouns attraction of San Antonio. The best place to see it is near the famous bars Savannah, Cafe del Mar and Mambo.